Web-Abacus™ is a complete web based loan portfolio management system. It supports flexible product definition, multiple sources of funds, any number of branches and multiple users with different levels of access and security. Web-Abacus™ manages clients and loans by mirroring the specific processes used in each institution, providing a customized system that meets the institution’s needs. 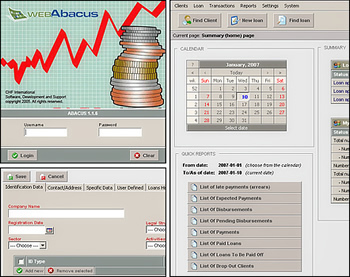 Web-Abacus™ also incorporates multi-level loan approval processes and provides a comprehensive set of reports.